Are you ready to turn your whole life around and RV full time? If so, downsizing is quite an adjustment. Here are some tips on tackling the 4 most important parts of downsizing. One of the biggest areas of your life to downsize is your wardrobe. Everything has to be minimized, and clothing is not excluded from everything. Many people are huge fashion fanatics, but if you are at the point where you are about to RV full time, I doubt your fashionista senses are on ten. So what’s the best way to minimize your wardrobe? The first step is to choose your base color. Your base color should be black, tan, navy blue, or grey, a neutral color that matches everything. All of your shoes, pants, skirts, jackets, and “basics” should be this color. I would recommend only choosing enough base clothing for seven to fourteen days. Will it be seasonally appropriate for your travels? Is there any damage? Tears, holes, stains? Is it comfortable and sensible? Can it be worn with more than one outfit? If the answer to any of these it no, throw it out! Make sure you do a second and third round of purging to ensure that you are fully minimized! After purging, go through your remaining clothes and fill in your gaps. Filling in your gaps means actually giving yourself a little bit of fashion substance. These are all of the wardrobe materials that can go along with your base clothes, like bright shirts, jeans, sweaters, etc. Again, I would only recommend enough between seven and fourteen days. Along with minimizing your clothes, you need to plan your travels to accommodate your wardrobe. If you are going somewhere with freezing temperatures, you need a full coat jacket. If you are going somewhere that has temperatures in the hundreds, you need bathing suits and sandals, etc. Knowing what you plan to do will help safeguard that you have exactly what you need to live. I know that you are thinking how much room can paperwork really take up? The answer is A LOT, and with the importance of some paper work, it is a crucial area when downsizing. This is an area that has steps as well. Pull all paperwork. This literally includes everything- receipts, passports, birth certificates, mail, cards, anything that is paper. Purge! In your initial purge, just decipher what can be trash. Anything that can be without question, throw it out. This includes old mail that has expired, receipts that can’t go on this year’s tax return or are past the 30 day return period. Your second round of purging is about what you love/like and what you need. Make two piles. Now go through your like/love pile. At the end of this pile, you are getting rid of this entire pile, but I have a way for you to keep the memories. Go through this pile and take pictures of all the things you wanted to keep. A picture can be printed into new “paperwork.” This gets rid of a chunk of your clutter while you aren’t actually getting rid of anything. Now go through the pile that you need. You won’t be getting rid of this entire pile, but hopefully a good portion of it. Figure out the things that you can keep a photo copy of and the things that you actually need the hard copy of, like your birth certificate and social security card. Take pictures of things that can be photo copied and throw them out! Lastly, find something to keep your small group of paperwork organize in, like an accordion file that can sit on a shelf. Your entire house is filled with furniture and you are about to move into an RV where you cannot take your king size bed, or double decker fridge. You honestly have to get rid of all furniture. This of course can be a sad step for most people. You personally chose each piece of furniture for your house and now you have to get rid of all of it? Who wouldn’t this bother. So I would recommend making it worth it. Sell your items! Have a garage sale so you can watch who takes your things. Or if you want to sell your items for a pretty penny, individually sell each item on a site. Take your time, sell to who you want to. And in turn, use the money to buy portable furniture you can use! Of course, you don’t HAVE to get rid of all of your furniture. There is another option, but it is not cheap. You can always get a long term storage. Most storage facilities have a monthly fee that you would have to keep up with, but it may be worth it if you are attached enough to your belongings. Also, a great way to pay for your storage is to sell the things that aren’t near and dear to you, then turn around and use that money to store the things that are. 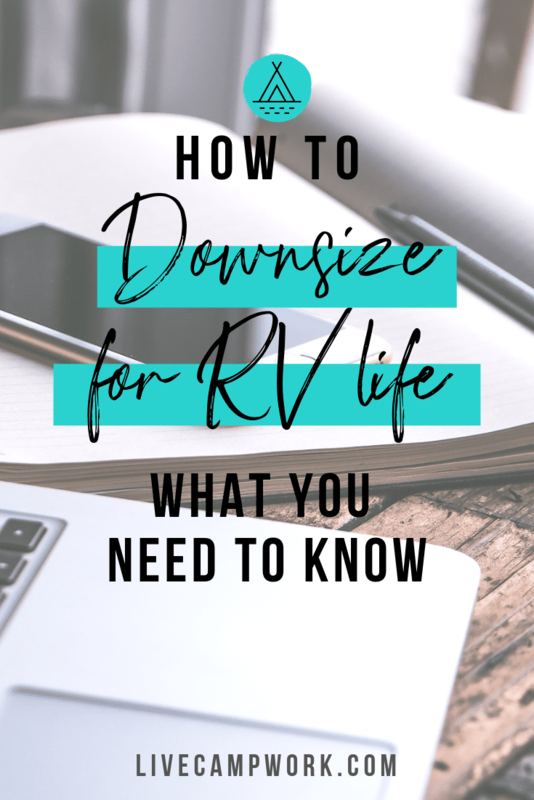 A big part of downsizing from a house to an RV is really realizing the size difference. This is a huge issue with cleanliness. Prior to making the full switch, you need to work on cleaning habits that will work in your RV. For example, get used to doing your dishes all the time. Leaving dirty dishes in a house’s kitchen sink will clutter and smell after a few days. In an RV, you basically are in one big room that is probably smaller than the entire kitchen in your current house. The clutter and smell will knock you out before the next morning. Learn to throw trash away and put everything back in its place. If you leave your shoes in the hall way, no big deal. In an RV, you have no taken away space that you honestly cannot afford. Cleanliness will help with the headache and anxiety of such a drastic change, so learn quick. Downsizing can be extremely stressful. It’s expected. Just keep calm, take it one day at a time, and don’t rush it. Find some fun in decluttering and remember why you wanted to downsize in the first place. With time, your new habits will form and RV life will be amazing! Brittany is my new blogging all-star around these parts! She's a bright young voice who works hard to deliver top notch travel content related to the LiveCampWork lifestyle and keep all things running smoothly here on the blog!